In the Germany of the 50s it bet for a type of economic vehicle that was contributing the essential of some previous experiences as for railway autorails adding new materials and technologies developed for the car transport that should allow the local lines to connect with the principal railway arteries. New material East was named Schienenbús (Ferrobús in Spanish) and it was allowing to flee of the classic conception of the travelers' heavy car dragged by a locomotive. In Spain, RENFE chose for this material adapted to his needs. When a network did not exist in Spain with densities similar to the Europeans, the service of the ferrobús in local lines turned into the substitute of trains mail or bus that they were dragging painfully with steam locomotives, in many cases complementing the diurnal services of line in combination with autorails like TAF or TER, which only realized stops on the most important stations of the line. Other services different from those who were done in Germany were the local trains of Madrid and Valencia, besides services in lines and secondary branches, I target for the one that they were designed. 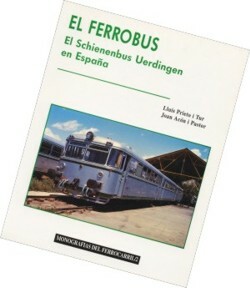 This volume dedicates to the ferrobús his history, description and services, joined an elegant graphical selection of the step of this series in RENFE and in other countries where it has circulated the Ferrobús or Schienenbus.